As a mom I love finding things that Mason and his friends cannot get enough of… Playgro has products for absolutely anything that you may need, from the first stages of your little ones life, up to their first years. Mason and his little buddy Cooper have the Clip Clop Activity Gym and now at four months old its such a helpful product to have. Watching them starting to focus on the dangling toys and looking at the bright colours make everything amazing in life! This activity play mat is great for a variety of reasons, there are plenty of toys to reach and play with, which makes play time a lot more fun for your little one, and its a great spot for tummy time (something Mason is still getting used to might I add). Tummy time, how can you use this for tummy time? I thought the same thing, but on the mat it has a flap that makes crinkle sounds that you can get them to try and reach to grab. This mat helps getting little ones stimulated by helping them to feel new things and reach out for them! 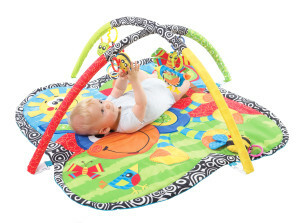 It comes with five detachable toys which you can keep hanging or take off for baby to play with. It has a little mirror so they can stare at their own cuteness. I have to add in, mirrors are Mason’s best friend… he is so obsessed with looking at that the little person staring back at him in his reflection. Lastly, I will say, any parent knows how much fun it is trying to get out of the house and remembering everything (insert sarcastic emoji here). When we say “oh hey we will be there at 7”… it means 8- if you are lucky. 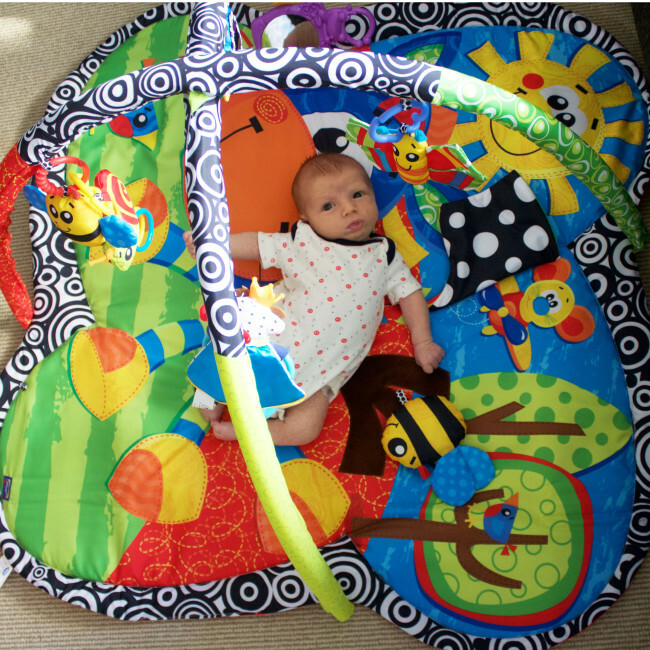 I always like bringing a play mat or bouncer where ever we go and this mat folds and packs up so easily without taking up much room at all. Its something I love bringing places because its so easy to take apart and put back together! ….This is something I find price effective and is so great for your little one and you. Do not let a product like this flash by you! Get is while you can. Honestly, take a minute to go on the Playgro website and check out all this company has to offer I cannot get enough.